I have no evidence to back it up, but I’m convinced that most conversations wouldn’t start if it weren’t for gas prices. At some point in time, “How ‘bout those gas prices?” virtually replaced “How ‘bout this weather?” as the opening line of choice. I'll explore many of the usual questions through this blog and invite comments, but it really boils down to this. The next time you go to the grocery store, look around and you'll see numerous "commodities" or products produced from commodities which are impacted by the same factors as crude oil. A poor orange crop means the price of orange juice will likely go up. The same with coffee beans and the price of your morning cup. 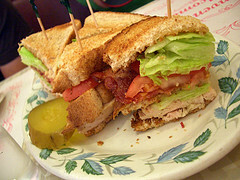 As I'm enjoying the food analogies, let's compare gasoline prices to a clubhouse sandwich. A really good one with three layers of bread and plenty of bacon. At the bottom of the clubhouse is usually where you find the meat. Crude oil is essentially the meat in the sandwich as it's the largest component of the price at the pump and has been for years. Crude oil is a basic commodity used around the world and is traded on the same commodity exchanges as coffee beans and oranges, meaning that's where the selling price is determined. Crude oil is then run through a refinery to make gasoline and other fuels, which brings us to the middle layer of the sandwich. Gasoline, having widespread common use around the world, is also a traded commodity. Depending on how much of both products are available, and how much demand there is, the price to buy gasoline at the wholesale level will either go up or down. This is somewhat complex, but relatively transparent as timely commodity information is readily available. The top layer of bread is always the most visible and can make or break the sandwich. That's where competition at the street level sits. The retail price is largely set by the local marketplace as there are a number of people offering gasoline for sale in most communities...both independent and major chains. The big price signs out front let you shop for the best price, which keeps the pressure on retailers to compete for your business. In between the layers of bread, you'll find a healthy portion of taxes and some money for the refiner and the retailer. There's obviously more to the story than that which we can discuss in further posts. But now I'm hungry for some reason. How about addressing the differences in pricing and speed of change for diesel fuel. Since buying a smart car (which runs solely on diesel) I've noticed the station I fill up rarely changes its diesel price - it's nearly always at 93.9... whereas gasoline pricing is much more volatile. Diesel prices are worth a few posts as there is very little information out there, so I'll start putting some data together. To give you a quick answer, there is a much smaller market for retail diesel. The larger market for gasoline...and the big prices signs out front drive volatility in gas prices. Margins for both products are pretty slim, but it boils down to this: When you sell more of a product, you can make less per unit and still cover your costs/make some money. That further "fuels" volatility in gas prices. With the smaller volumes of diesel sold at the retail level, a price war could get punishing in a hurry. As I write this, I'm thinking the recent upward trend in diesel prices is worth getting into in the future. Keep an eye out. We should look at the prices of GASOLINE that the top OIL producing countries are paying. They are paying almost nothing! They pay a few cents a liter. We always comapre ourselves and all the prices to the US and EUROPE. We have a lot of Crude Oil (second largest reserves in the world) we should be paying half of what we are now. The Canadian government should be taxing ever liter of OIL exported and putting that money directly into FREE public transit. In cities like London, Paris, etc. one doesn't need a car. With 20 or so lines of subways we wouldn't need cars in the GTA either (summer cottage trip and that's all). That's the only reason why some people there have cars. In a barrel of oil there is 205 litre at$129 US, why is it when our strong Canadian dollar goes up so does our price at our pump? It seems at $1.29 per Litre in Can. dollar Petro Can is adjust always upward to the barrel price. Will you ever adjust the price down?